A Rocket Lab Electron rocket. The small-rocket startup Rocket Lab will attempt to launch its first customer payloads into orbit tonight (Jan. 19), and you can watch it live online. 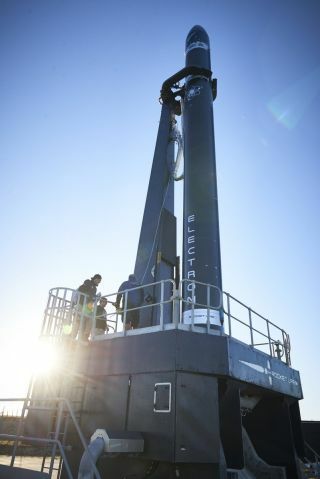 Rocket Lab's Electron rocket is scheduled to lift off from the company's private launch range in New Zealand on the afternoon of Jan. 20 local time, which means the evening of Jan. 19 on the U.S. East Coast. This will be the company's second test launch of the rocket. The four-hour launch window opens at 8:30 p.m. EST on Jan.19 (2:30 p.m. NZDT on Jan. 20). The company will provide a livestream of the launch on their website, starting about 15 minutes before the rocket's anticipated launch time. The webcast will also be available on Rocket Lab's You Tube channel and Facebook page. Space.com will also carry the webcast live. If the rocket doesn't launch today, the same daily launch window will remain open for 8 more days. The launch was originally scheduled for early December, but various issues (mainly weather) stopped the company from launching the rocket then. Prior to the December launch attempt, company representatives said they would only launch the rocket under ideal conditions, and that delays were likely. "We're expecting to scrub multiple times as we wait for perfect conditions and make sure everything on the vehicle is performing as it should," said Peter Beck, Rocket Lab founder and CEO, in a statement released in early December. This is the second of three planned test launches of the Electron rocket from the company's Launch Complex 1 on the Mahia Peninsula, New Zealand. The launch vehicle being used for the test flight is titled "Still Testing," but it is carrying three customer satellites. One is a bread loaf-size, Earth-imaging Dove satellite from the private company Planet (formerly Planet Labs). The other two are both Lemur-2 satellites for the private company Spire, which could be used for tracking ship traffic or mapping weather. This will be the second test flight of Electron. The first test flight took place May 25, 2017. During that flight, the third stage of the rocket didn't attain its intended altitude of 310 miles (500 kilometers). In August, Rocket Lab issued a statement saying that a review of the May 25 attempt "found the launch had to be terminated due to an independent contractor's ground equipment issue, rather than an issue with the rocket." Electron stands about 55 feet (17 meters) tall and can carry up to about 500 lbs. (225 kilograms). Unlike most traditional rockets, Electron is designed primarily to send small payloads into space, Beck told Space.com in 2016. The rocket is intended to give customers more flexibility regarding when their payloads launch and how often, instead of being subject to the scheduling demands of larger payloads. Rocket Lab has a few competitors in the small-rocket business, including Virgin Orbit (formerly part of Virgin Galactic, but now a separate entity in the Virgin Group), which is planning test flights of its LauncherOne small-satellite launch system this year. Another potential competitor is Vector Space Systems, whose Vector-R rocket performed a low-altitude test flight earlier this year.